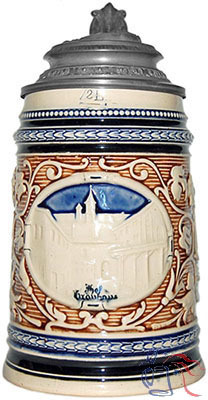 The centrally featured Hofbräuhaus was founded in 1589 by Wilhelm V, Duke of Bavaria, and originally served as brewery to the royal residence. Today this Munich landmark is owned by the State of Bavaria and has become both a must-see tourist stop and a focal point of the city’s annual Oktoberfest celebrations. 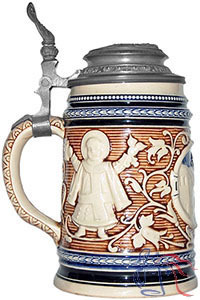 Side images on the stein show two depictions of the Münchner Kindl (Munich Child), another well-known city symbol.